We are staying here with family, Keith and Kathy Astbury (Thank you! ), for the next week or so as it is close to Oultan Park - the motocross track with tar on it where our next race is. We arrived on Monday afternoon to a delicious supper and got settled to set up for our tackday on Wednesday, and what a trackday it would turn out to be! Rain and icy wind is what we were greeted with on the morning of the trackday, but nevertheless we made our way to Oultan Park circuit in Tarporely. A quick sign-on and briefing later, I shivered my way onto the bike and headed on track. This was the coldest I have ever been, with approximately 2 deg temperatures and ice cold wind backing pouring rain, all being blasted at 100mph at my fingers and toes while I tuck behind the fairing! By the end of the session I thought I was going to get frost bite! I pulled in and thawed out my icicle-digits and toes before reflecting on the legendary circuit. The track is laid out in the hills and appears that nothing was leveled or smoothed before laying the tar. It's pretty narrow and follows all the contours and cambers of the land, reminding more of a type of supermotard tar circuit more than a superbike circuit! Unfortunately all my sessions were in the cold and wet so I couldn't really open the bike up properly to get the dipping and jumping sensation I imagine you would get in the dry. After a few warning shots from the bike, high-siding me out of the seat and onto the tank, I got settled into the pace to run in the wet conditions and got some valuable wet track experience! As you come out of the final, on-camber turn, you accelerate hard, with lean angle, up and over a steep hill onto the start/finish straight, which isn't straight either. Then brake hard and swoop into turn 1, dipping into the on-camber at the apex and accelerate to a quick right hand kink before braking left into turn 3 and onto another (sort of) straight. Then drop a gear and into a fast left hand sweep before braking very hard into a big, banked hairpin, just same as Cape Town corner at Killarney. Then accelerate out on the tar 'berm' and into a sharp chicane before accelerating hard again, up and over a big hill, front wheel dancing around. Down a (actual) straight and brake into another more open chicane, then accelerate out to another big hill. You short shift to 4th and, with lean angle again, feel the whole bike lift up and want to wheelie around as you crest it, then tuck in at angle before a left hand kink and brake into a double apex right hander, very similar to Malmesbury, also at Killarney track.then out over a set of 'whoops', about 4 or 5 humps in the straight constantly moving you and the bike around, before you brake hard into the final right hander, turn into the on-camber, hit the apex and accelerate up a small hill leaned to the right, down into a dip, flick left and up the other side onto the start/finish straight. What a lap! The track must be incredible in the dry, at race pace. Wheelie and lean angle city! I am looking forward to the race coming up on 5 - 7 May, in a weeks time. I will keep the updates coming! I would like to say a huge thank you to Forcefield Body Armour in the UK who have agreed to sponsor us with base layers and protective kit for the season. Great to have it come together and we look forward to working with them! - Thanks Freddie Hall at Motosport Distribution for putting us in contact. After our hectic past few weeks of racing, we finally got a bit of a breather. So we decided to use this time to act like tourists for a bit! We started with the obvious thing to do, and headed to the great city of London last Friday. I had only heard of the wonders hidden in the city, but my Dad had experienced much of London already - But that was in 1973. We were to run in to a very different London from then! First off, was hop on the train from Colchester to Westminster Station, and about 45mins later, we walked out the station steps and straight onto Big Ben's feet! I was amazed at the real thing. The postcards and photos do nothing for the detail in the architecture back then, spanning the entire city's buildings from that period. After making it completely obvious that we were tourists by taking about a hundred photos in our first 10mins, we headed over the River Thames on foot to the London Eye (big ferris wheel). We got our tickets and joined the multi-cultural que of tourists to get onto one of the 32 pods on this 100m diamtere wheel. The Lodnon Eye gives you an amazing view of commercial London, lifting you high above the CBD, you see the mix of beautiful old architecture and modern technology.Most of the buildings being from the 18th century but housing the worlds most advanced technology and web innovations - quite a sight to see! We came down from our 30min trip and took a walk around in the jungle of skyscrapers and castles. We then found the London Bus tours and hopped on. This was money well spent! We left from the Lodnon Eye, and headed towards the famous London Bridge. This is when it dawned on me how much history is in the city - songs, nursery rhymes, sayings, artists, bands - this is the place where it all happened and spanned over the last few hundred years! We crossed the bridge and drove past one of the first castles built after one of the European conquerers took over the Thames. He built the catsle on the river because it was beileved whoever owned the river, owned the city, and boy did he build a castle! The massive building was an all luxury splurge by the conqueror, again hosting the incredible detail in the walls, pillars etc. that Big Ben has. Now, it is used as a museum and municiple building, the huge moat was drianed and is now a publis park! That's what you have to love about the city, the history is embraced and maintained. Next was the drive to the business district past theatrecal London, passing historical theatre after theatre, and the famous St.Pauls cathedral - another astonishingly detailed and beautiful building. We then arrived at the business district after passing buildings such as the BBC and Barclays Bank being housed in original buildings from the 1700s! The first monument being the public viewing gardens for beheadings and hangings... It was the real deal from the medieval era. After passing the city Dungeons, Jack The Rippers local hangout back in the day and many other awesome buildings and statues, we crossed over the Thames to return. Our day had just run away from us with so much to see, and now we've only scraped the tip of the ice-berg of histroy hidden in the city. We returned on sunday for the London Marathon, meeting Eevie (my second mother growing up, Evelyn Neill) and Rab to support Rab's brother. We arrived to a sea of over excitied and enthusiastic people wanting to do the same for their runners! The place was buzzing! We watched the runners go by dressed up in all sorts of weird and wonderful costumes, including Rhinos, Supermen, Ballet dancers, South Africans..., Stigs and even a Storm Trooper! We then had a nice South African Nando's supper and started our ridiculous trip home. This consisted of delays, rail closures and incidents and a whole lot of confusion. Anyway, nearly 5 hours later we got home! But nevertheless, a great weekend on the whole which has left us hungry for more London. I am starting to collect a list for when Roxanne arrives that will certainly stirr many 'ooh's and 'aah's! We are now on our way to the north to Chester, where we are staying with Kathy and Keith, our family playing host to us while we practice at Oultan Park on wednesday. Our next race is at Oultan in a weeks time on 5-7 May for the long weekend. ...And my mom is arriving this week for a quick visit! It will be great to see her again and we're both looking forward to it! 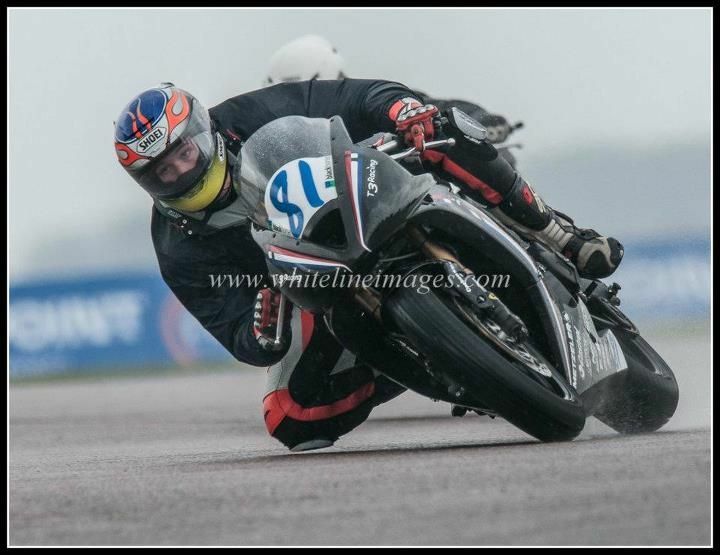 We've had an awesome weekend of racing here at the fast, bumpy Thruxton circuit. Tricky weather for practice and qualifying, then familiar territory for the races saw us take two 2nd place finishes and a double win in the premier (rookie) class. New ruling had been made with regard to classing. They divided us into two classes - Elite and Premier. Elite being the main class, with the fully sponsored British Supersport ride with Triumph being the main prize, and Premier, with a fully supported ride in the Triumph Triple Challenge again the next year being the prize. I had chosen to be Elite as I am aiming for the Supersport ride, but now they've found I am eligable for both as I have no experience in British racing and have not finished higher than 3rd in any other national championship. Elite is for the more experienced, and premier for less experienced riders. This morning we woke to clear skies and sunshine, which, uncharacteristically, held all day for a great day's racing. The crowds arrived by the tens of thousands! We had no morning warm up today and went straight into race 2 with just one warm-up lap. I took up my 2nd position on the grid, based on our fastest laps from race 1, and waited for the lights go out. I got off the line well and dived into turn 1 behind fellow countryman, Phil Atkinson, who got the holeshot from 3rd. Rob Guiver, race 1 winner was behind us in 3rd, and in hot pursuit. Phil upped the pace and the three of us broke away and a hectic race of swapping of paint and positions ensued! Nearly every lap saw the lead change with all three of us taking it multiple times during the 12 lap race. With Thruxton's long sweeps lending themselves to slipstreaming and dive-bomb passing, the fight was on and at very high speed! The pace got very fast with all our laptimes covered by less than 0,1sec! The lead swapping continued the entire 12 laps until 2 to go, when Rob and Phil passed me for the lead. I got Phil back and had Rob right where I wanted him - just in front of me coming onto the final lap. Unfortunately he found a turn of pace in the last few fast sweeps before the final straight and, setting the fastest lap, leaving me just out of reach of his slipstream. I braked as late as I dared but it was only just not enough! We went through the final chicane and over the line with Rob 1st, me 2nd and Phil 3rd. What a race! We were back on the podium! I pulled into the podium box and was once again greeted by my over-joyed dad. And many cameras! The BSB series really know how to make you feel professional. We made our way to the interview box, did all the Eurosport interviews, then collect our trophies at the podium. First up was the premier class, and I got to stand on the top step of the podium to collect our 1st place trophy! Then the main class, the Elite class - We took up our positions in front of the crowds, collected our trophies and let loose with the champagne! We did our last two interviews with other motorsport channels and headed back to the pits. All the time thinking to myself what a professional series the Brits run. We are now sitting back in the caravan after watching the Superbikes and other spectacular bikes finishing their day's racing, planning to leave leisurely in the morning for home. We are very pleased with our results this weekend and I had a great time racing against the likes of Rob Guiver and Phil Atkinson and all the others in this closely fought championship. Thank you to everybody who was backing us this weekend, at home in SA and abroad! We arrived at Thruxton on thursday monday with an open mind as we were at a circuit where I have had no experience besides driving around the track in a rental car. The weather was once again foul, but luckily our results weren't! The sun was out and it was warm - we even took off our jackets! ...for about an hour. Then the rain came down for about 5 mins and wet everything, and then the sun came back out. This was what the weather was to be for the friday and today. This is the fastest, and bumpiest circuit I have ever ridden - a combo that doesn't really go together! Potter's pass and Rifle in East London are South Africa's fastest corners. Thruxton made up of many Potter's Passes and Rifles, with two infield chicane sections, and no actual straights. So a very interesting track indeed! And a FAST one at that! Friday morning we got the pit set up and the bike out ready for a dry practice, when all of a sudden...we had a dry practice! The rain held out long enough for us to ge out in the dry. We were 6th in the standings, with the experienced riders from other classes topping the boards. I still had lots to learn. Practice 2 in the afternoon also saw a dry session after the sun dried rain from the previous hours. Struggling with a set up that worked on the bumpy and fast track, we ended 8th. Still happy under the circumstances. We fiddled tyre pressures and suspension and packed up. We woke up this morning icey cold weather and rain. We made our way to the pit and as we arrived, it really bucketed down! We were on to qualify at midday, and the clouds were still coming in thick and fast - the weather looked set for the day. A wet, rainy qualifying on this fast circuit was tricky, but we managed to slot into 3rd early and sit there for a while, every lap feeling the grip levels more and more. Problem was that everybody was too! I was bumped down to 6th at the end but the gap to 3rd was only 0.07sec. The weather cleared as the afternoon drew in, bringing out a warm sun to dry up the circuit. In no time, we had a dry race on our hands! We headed off to pit lane for our race at 4:30pm, on dry tyres. I took up 6th on the grid and waited for the lights to go out. They went off and I got a good launch and tried to dive for the inside of turn one, but got the door shut on me by Finnish 125GP champion - Valter Patronen. I lost all my drive and a whole lot of positions. Luckily a few opportunities came up into the next set of chicanes and I caught up to 5th. There I had to chase and gain positions one by one. I slotted into 3rd behind Valter and Rob Guiver (Veteran British 125GP racer) and tried to keep steady with lap times. I caught Valter and got in his slipstream down one of the long sweeps and got him on the brakes into the final chicane. I could now chase after Rob, who had pulled a 2 second gap on us. I set the fastest lap of the race and then a lap later, Rob answered back by going 0.04sec faster! Then Valter went down in a big way, causing a red flag and ending the race 2 laps early. We had secured 2nd place! I came into the pits and got directed to the BSB podium box - what a feeling! Greeted by my dad in absolute joyous celebration, I parked the bike and made my way to the podium. We had got 1st place in the the premier class (for rookies to the BSB series) and 2nd overall! So I got stand on the top step of the podium, then the 2nd place for outright position - again, what a feeling! I sprayed the champagne and made off with our silverware! This evening we had a braai at Phil Atkinson's pit, who took 3rd place, putting South Africans on two of the three podium spots!